The MONUC 'Kisangani without arms” objective, which was launched on Friday October 13 2006, has been a success to date, as the amount of unauthorised men with arms circulating the city has been drastically reduced, in the run up to the forthcoming election on October 29. 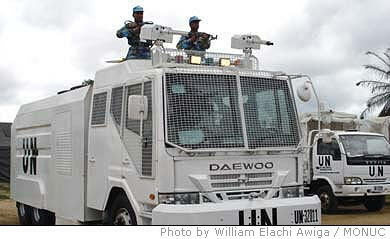 The objective, which controls and verifies the presence of armed personnel in the city, particularly at night, comprises of joint patrols involving MONUC Military, Police and Security, as well as the Congolese National Police (PNC), the Congolese Armed Forces (FARDC) and the Formed Police Units (FPU). According to MONUC Kisangani force commander Col. Edouard Mbengue, the overall objective is to ‘remove any source of potential tension or provocation’ in the city, in the pre and post electoral period. Prior to this, an agreement was worked out between MONUC and the FARDC and Republican Guard commanders so that their respective elements would be confined to their barracks for the pre and post electoral period. “We have also set in place mixed verification teams of MONUC military observers and FARDC personnel, to ensure that everyone is respecting this agreement. So far everybody is obeying these measures, and only those with prior authorization are allowed to circulate the city with arms,” Col. Mbengue explained. “The local population is very happy with the new measures, and the level of nighttime violence and harassment in the city has decreased. We also plan a show of force in all areas of the city right before the elections to remind people that we will not tolerate any attempts at violent disruption of the forthcoming elections on October 29,” he concluded. The Kisangani ‘city without arms’ objective is scheduled to be in operation up to the end of the post electoral period on November 20, but can be extended, depending on the prevailing security and political atmosphere. This MONUC objective, following its success in both Kinshasa and Kisangani, is also planned to be extended to the eastern parts of the DRC in the near future.